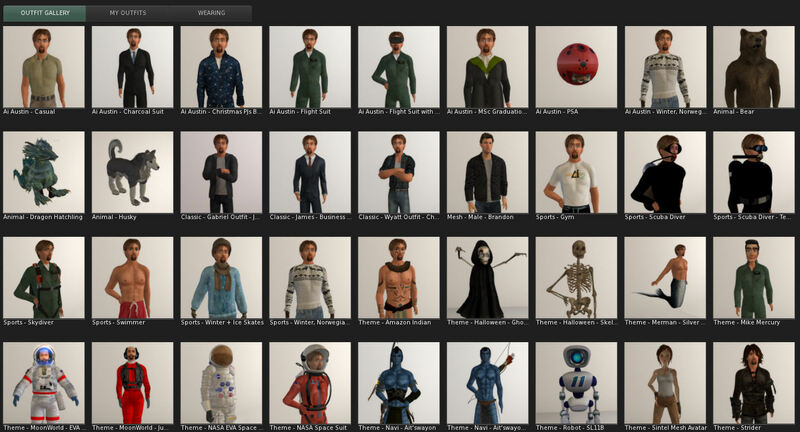 A version of the Second Life Viewer which support a visual gallery of avatar outfits is being tested. The Outfits tool is extended to include a “Visual Outfits Browser” (VOB). Thumbnails (typically 256×256 or 128×128 images) can be created in the viewer or uploaded at a cost of $L10 per image in either case. The Outfits Gallery is supported in a Second Life “Project Viewer” which is created to explore new features ahead of them becoming stable enough to include in a normal release viewer for everyone to use. For this exploration this version was used: Second Life Project VOB Viewer Windows version 4.0.6.316123 (6-Jun-2016) was used. For the future, an ability to drag and drop images from inventory directly onto the folders in the Outfits gallery view would be useful, especially if you have a lot of outfits. At the moment, when a thumbnail image is assigned to an Outfit in the gallery view it appears at the top of the list of outfits, rather than staying in alphabetical order. For some purposes that could be useful, but a way to use “sort with images first” or “sort by outfit name” would be helpful for those with many outfits, and variants of outfits for specific purposes. This entry was posted in Second Life, Virtual World and tagged Ai Austin, Avatar, Second Life, Viewer, Virtual World, VOB. Bookmark the permalink.